Sorry this is a day late! My Christmas fun just ended yesterday afternoon. I hope your Christmas was wonderful and blessed! I am still in “eating from my freezer” and organizing mode. All of the astericked (*)items are from my freezer, frig or pantry. I know it is a little bit unbelievable, but I still have so much left in the freezer. Well, I acutally have a large freezer and a refrigerator with a freezer in my garage, plus my refrigerator/freezer in my kitchen. So, there is a whole bunch of food there! As far as my budget… Shame! I am finding it very hard to spend only $50.00 over the holidays. I am spending quite a good deal less than I normally would, but I am also feeding more people. It has definitely been more than $50.00. So I will regroup, recommit, and retry this next week. I want to keep up this end of the challenge! I challenge you too! Dig into your freezer, frig and pantry and eat what you have. Set a new limit for your grocery bill while you are participating in this challenge and save the extra money. Then, you will have a new start! After everything is eaten we can organize and inventory. I am determined to never again have 5 frozen chickens in my freezer at one time! Doing this together will make this journey to clutter freedom and culinary accountability so much easier! So far Mrs. P from Faithfulness Farm and Jeanette from Starting Over are joining me. Check out the yummy Cowboy Chili Mrs. P made with leftover from a Christmas standing rib roast. Gail, your recipes are delicious! And then all you dog lovers go see Jeanette and her guest blogger. Now that she has the cookbook for dogs we are all waiting for recipes Don’t you just love our community? I sure do- such great people! Just leave me a comment and I will mention you on my blog and include you in the challenge. If you don’t have a blog, don’t let that stop you- leave a comment and join in. I will mention you too! This is going to be fun! Also, if you have any food challenges, let me know and I will I will open them up to this great community for ideas. One more thing- if you have any great organizing and inventory ideas, again let me know and I’ll share them! Now, isn’t this getting exciting? Want to join me? Come on!!!! I found 2 frozen lobster tails (I originally got 6 on sale) and a bag of shrimp hiding in the freezer. My sister, Lisa, has a wonderful seafood casserole recipe she shared with me, so for company on tuesday I am making this great treat! Lisa also made and gave me this insanely good recipe for Lasagna that I am making on Monday. 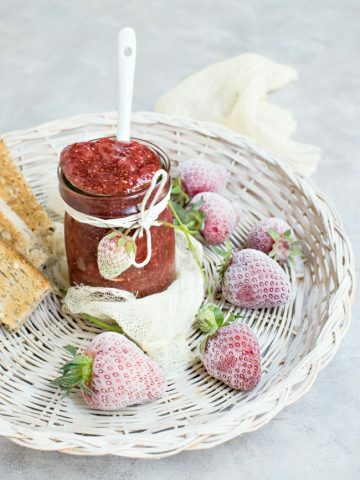 If you try one recipe, this is it! I think that it is an oh, so flavorful and dressy lasagna. Very sophicated and a dining delight! I am with lots of family again this week. We all decided to be together for New Year’s Eve and the weekend. So the feasting continues with everyone bringing food!!!! New Year’s Eve will be a night of family games, stories and hugs all ’round! We have done so many different things for New Year’s, but this is my favorite! Family! Doesn’t get any better than this! 1 Box Lasagna Noodles* For a real treat use fresh lasagna sheets, very yummy! Remove sausage from casing, break into 1 inch chunks. In a large dutch oven or pan heat oil over medium heat; cook onions until translucent- about 4 minutes. Add sausage and cook until sausage is no longer pink, aprox 5-8 minutes. Add red pepper and cook 5 minutes. Add tomatoes, a pinch of salt and pepper, simmer for 25 minutes. It will thicken. Melt butter in saucepan over medium heat, whisk in flour and cook for 3 minutes without browning. Whisk in milk and bring to simmer. Reduce heat to medium low and cook constantly stirring until thickened, about 10 minutes. Stir in a pinch of salt and pepper, nutmeg, spinach and mozzarella. Cook until mozzarella is melted. ~Meanwhile, cook noodles and drain. Arrange 1/4 of noodles in a single layer in a greased 9 x 13 baking dish. Spread with half of the meat sauce. Top with 1/4 noodles and half of the Basciamella Sauce. Top with 1/4 noodles and remaining meat sauce. Top with 1/4 noodles and Besciamella Sauce. Sprinkle with parmesan cheese. Bake for 45 minutes until bubbling. Let stand for 10 minutes and serve. Serves 8. This lasagna freezes great! I make a double batch and freeze 1 for later. 1/2 to 1 cup seafood stock* I have vegetarian stock that I will simmer the shrimp tails and lobster tails in for about 30 minutes to make seafood stock. In a large saucepan heat 3 TBS butter. Add onions and celery and cook until translucent. Add flour and cook for 3 minutes without browning, stir. Whisk milk until thickened, about 10 minutes. Add 1/2 cup seafood stock and gently cook until thickened. Adjust thickness by adding more seafood stock if needed. Stir in 1 1/2 cups cheese until melted. Add seafood and a pinch of salt and pepper. Transfer to a 9 x 13 baking dish. Melt remaining butter and toss with remaining cheese and bread crumbs. Sprinkle over casserole. Bake for 35-45 minutes until bubbly. While casserole is cooking, make pufffed pastry shells according to package directions. Remove the “lid” of the shell and fill with heated Seafood Casserole and top with lid. This is not rocket science, so I don’t have specific directions. I use about 3 parts iceburg to 1 part red cabbage. Chop into very small pieces. I add a couple of green onions a small handful of parmesan and sunflower seeds. Dress with italian dressing as you would a salad. Mix and serve. You can change the porportions to suite your taste! In a large bowl mix sour cream, onion, garlic, lemon rind, lemon juice, worchestershire sauce, thyme, salt and pepper and cayenne pepper. Pat chicken dry with a paper towel and add to mixture. Turn to coat. Cover with plastic wrap and refrigerate for 8 hours. In a shallow bowl, combine cracker crumbs with chili powder. Roll chicken in crumb mixture, coating thoroughly. 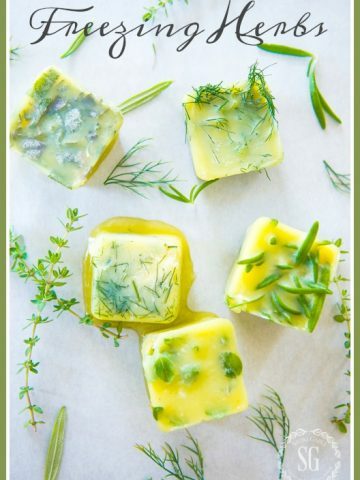 Arrange in baking dish without touching and drizzle with butter. Bake for 45-1 hour until coating is crisp and chicken is no longer pink inside. It is important to use different types of apples to get an applesauce with good depth of flavor! I always use tart ones such as Granny Smith’s, Winesap and McIntosh. I then will use Gala, or Red Delicious. I also like to throw in a couple of pears- my favorite is Bosc. They give applesauce that extra “something”. Cook apples, water, and sugar in slow cooker for 6-8 hous on low. If you are putting the apples in with peels and core, omit the sugar. Cooking time may be a little longer. When cooked and mushy, mash out any lumps with a potato masher or fork. Add cinnamon to taste. * If you are making applesauce using a mill, process the apples in the mill and return sauce to slow cooker. Add sugar to taste and cinnamon or red hot hearts and cook on high until incorporated. Cook macaroni according to package directions in large pot. Drain and return to pot. In a large dutch oven, melt 4 TBS butter over medium heat. Add onions and cook until translucent, about 4 minutes. Add flour and stir. Cook for 3 minutes without browning. Whisk in milk and continue stirring until thickened, about 10 minutes. Add mustards, worshestershire sauce and cheese. Stir until melted. Add cheese sauce to macaroni and transfer to a buttered 9 x 13 dish or large deep bowl. In a microwave proof bowl melt remaining butter. Add breadcrumbs and cheese. Sprinkle over mac and cheese. Bake for 30- 40 minutes until hot and bubbly. This recipe is great! It can be doubled or trippled. It can be made up to 2 days ahead before baking. I add ham and veggies for a complete dinner. Add-ins such as seafood, bacon, broccoli make it extra special! This is hands down my family’s most requested and favorite side-dish. Thanks Aunt Sue! In a large pot, simmer veggies in broth until tender. Add soup, clams, wine and seasonings. Thoroughly heat. Add extra milk or cream until desired consistancy is reached. This soup can be done in a slow cooker, except for cooking the veggies. Put tender veggies, soup, clams, wine and seasonings in slow cooker on high for 2 hours. For vegetarian chowder use water or seafood stock instead of chicken stock. I am joining Susan at Between Naps On The Porch for Metamorphosis Monday. Check out all the great before and afters! 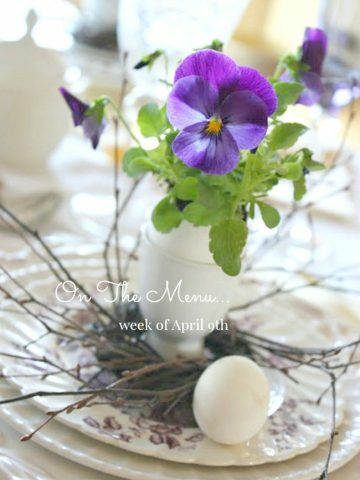 I am also posting this menu on Organizing Junkie for Menu Monday. 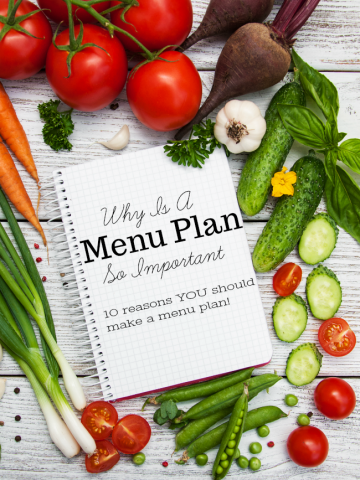 There are well over 100 wonderful menu plans and tons of inspiration! If its not too late I want to join in! 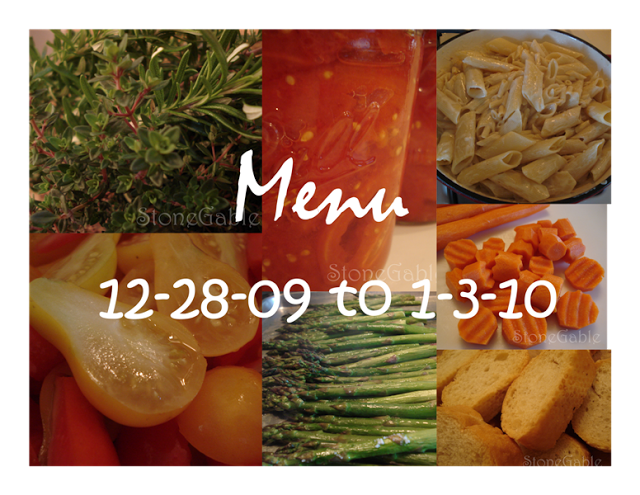 I have been looking at your menu’s for ideas and honestly guidance…. To me your the Wizard… I’m in Awe of your greatness! Teach wise one… I’m already making my mashed potato’s in my crock pot for holidaze twice now! Great menu! I would love to join you in eating from the freezer, but mine’s pretty sparse after doing that for most of December. Oh you lovely lady I have missed you soooo much! I was starting to have withdrawals! I am glad that your holidays was as wonderful and enjoyable as you are. I would have to say that anything you make is delicious! My husband loved the Chicken Parisian that I made using your recipe for his birthday. I am on a goal to stop with the “fast food” thaw and freeze junk that seems to fill up our menu. I want to start making more “from scratch” and utilizing your recipes. I am sooo excited about you making the venison dish! I know it will change your idea about it. I use a large ziploc bag to marinate in so the smell can’t escape. Also you just have to toss it a bit to mix it up. If you have any questions, ask away! I’m going to be nervous hoping that you like it. I am looking forward to having you back full time now! I hate having to share you! Teehee! Great idea, Yvonne. I don’t even know what is in my freezers! But I am using you as inspiration! Boy do I need this challenge. I have the same setup with freezers and refrigerators both in the house and out in the garage. I think a family of four could eat from them for several weeks. I have a container of taco meat that I’m going to start your challenge with. Pampered Chef has a great recipe for a taco ring and that will be dinner tomorrow evening. It’s a start. Wow, Yvonne, what a great idea and challenge. I guess without knowing it, I’ve been doing a bit of the same. Our Christmas Eve extravaganza included lobster, clams and shrimp cocktail.On Christmas day I served the clams and shrimp as appetizers along with Prime Rib and baked potatoes. On the day after Christmas, I made lobster roll for lunch. Then I combined several lobster bisque recipes to use up the lobster. It was a bit of a challenge because the lobster was already cooked so I used the shells of the lobsters, the few shrimp and few clams left to make the start of the stock. I had the butcher cut the prime rib off the bones (for Christmas Day) and then reattach them, so you got the flavor without the mess of carving with the bones. Next I cooked up the bones along with veggies to make beef stock. That’s in the freezer, along with left over clam sauce and a wee bit of the lobster bisque. I think I’m ordering take out for tonight!!! It all looks good!! We are definitely eating what we have around here this week, but our traditional New Year’s Day dinner is black-eyed peas with ham, candied tomatoes, cooked greens and cornbread. We started eating from the freezer also. The clam chowder sounds so good. No one will eat clams but me and I would never eat that much so I will just have to savor your recipe! Happy New Year. Yvonne, this seafood casserole sounds soooo delish! I need to join you in “eating from my freezer”. How on earth do we manage to get so much in those???? We will be playing tennis on New Year’s Eve…or at least, I will be. DH will watch & cheer for me. Our friends host a midnight round robin at our tennis club every year & it has been the greatest way to start off fresh…exercise & healthy foods with friends & family. My world has truly been made a more beautiful place by you sharing yours.